Since Mahesh Babu plays a politico in the film, the day seems to be an apt one to release promotional content of the film. Superstar Mahesh Babu is currently shooting for his next with director Siva Koratala which is rumoured to be titled ‘Bharath Ane Nenu’. The film will have Mahesh Babu playing the role of Chief Minister which will be for the first time in his career. A while ago, a photo of Mahesh Babu from the shooting location of the film had gone viral and many had assumed that the photo was the first look of the film. However, director Siva Koratala clarified that the picture was a leaked image and not the first look poster requesting everyone to not spread it. 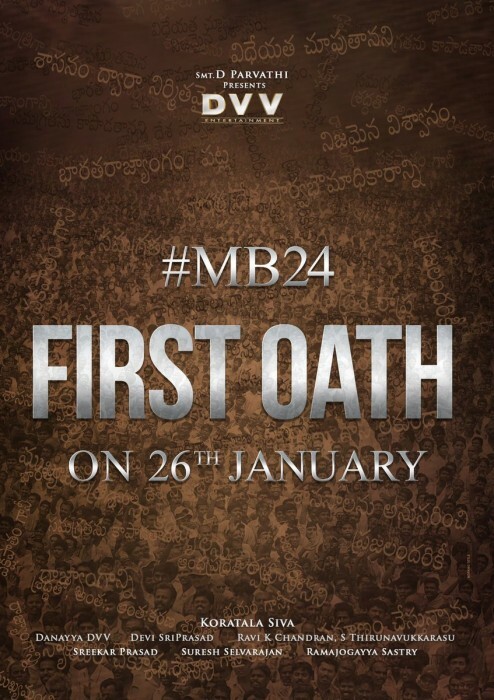 The makers have now confirmed that the first look of the film, which is being referred to as MB24 since it is Mahesh Babu’s 24th film, will be out on January 26th, 2018 on the occasion of Republic Day. Since Mahesh Babu plays a politico in the film, the day seems to be an apt one to release promotional content of the film. Tentatively titled ‘Bharath Ane Nenu’, the film will have veteran actor R.Sarathkumar playing Mahesh’s father in it. The film will feature Bollywood actress Kiara Advani as the leading lady and will mark her debut in Tollywood. The makers zeroed in on Kiara Advani after having auditioned many actresses across all the film industries, and finally confirming the ‘MS Dhoni’ actress. The music of the film is being composed by Devi Sri Prasad while the camera work is being managed by ace cinematographer Ravi K Chandran. POsani Krishna Murali will be seen playing an important role in this film which is slated for a summer release. Mahesh Babu was last seen in A.R.Murugadoss directorial ‘Spyder’ which was a disappointment at the box office. The film failed to impress the audiences and eventually bombed at the box office. Spyder was also Mahesh Babu’s first straight film in Tamil and marked his debut in Kollywood.